Some users who updated or upgraded to RadarOpus 1.41, had the impression that they were already using some polar symptom analysis in previous versions of Radar 10 or RadarOpus. Here are some clarifications which may help to understand why we announced this as a new feature of version 1.41. Radar 10 came with versions of Bönninghausen's Therapeutic Pocket Book (b2) which contained polar symptoms (called polarities at the time). A polar symptom is a symptom which is opposite to another symptom, such as "eating agg" and "eating amel". They were indicated with a blue background and by clicking on them, the user jumped to the opposite symptom, much like a cross-reference. When an analysis was made including polar symptoms, these were highlighted in blue to draw the attention of the user. There was no specific function related to that. In addition, the polar symptoms were used in the Bönninghausen Module, more precisely in its part the B-method wizard. This wizard prompted the user to enter a main symptom, a localization, a sensation, a modality and a concomitant. When the user had completed these steps, automatically, the related polar symptoms were added to that list. However, there was again no specific function related to that. 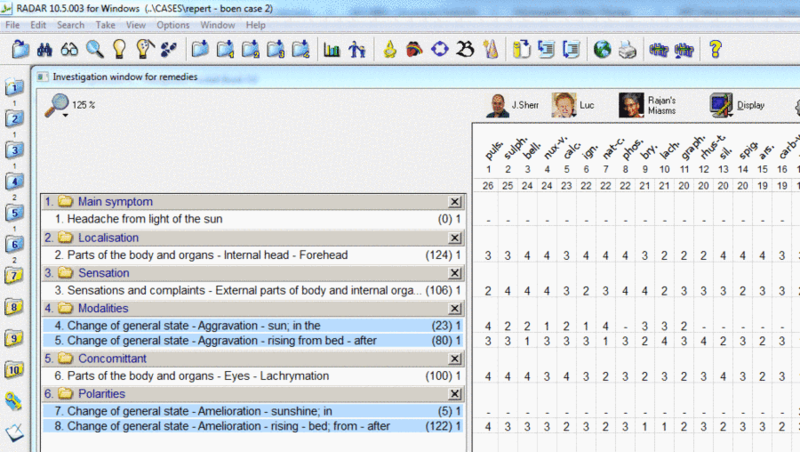 In the resulting analysis, the remedies were sorted following the method "sum of symptoms and degrees", as can be seen the screen shot below. The polar symptoms were included in this sum, waiting for further development of a more correct calculation. As the development of Radar was stopped in 2010, this correction never took place in Radar. Therefore we can say that the polar symptom analysis in Radar was not functional or even non-existent. For all these reasons, the polar symptom analysis is only now fully operational, slick and easy. In Radar it was virtually non-exsitent, in the earlier RadarOpus version it was only a rudimentary version that was not protected and temporarily usable also by those who did not buy the Bönninghausen module. Also these future features will be free for those who bought the Bönninghausen module. Read more about the options you have to upgrade to the polar symptom analysis.